That works for some but there are a few of us that will get our bass fishing fix by fishing Power Plant Lakes. These are cooling lakes for Power plants, whether its nuclear or coal generation, these lakes don’t freeze in the winter months. One lake in particular that I like is Clinton Lake, (about 2 hours south of Chicago) a 4,900 acre reservoir that’s a cooling lake for the Clinton Power Plant. In the dead of winter we’re catching bass in 50 degree water on crankbaits, plastic worms and slow rolling spinnerbaits.and believe it or not stay fairly warm in the cold months. The other nice thing about these lakes is that they are usually stocked lakes, most of them are bass factories, so you will likely get some kind of action all year. Here in Illinois, where I live, we have several lakes just like these all over the state. This is a great practice lake in the winter month’s because with the warmer water from the hot discharge it will teach you how to fish currents, practice your prespawn-spawn techniques, and it will help you gain confidence with baits as well. 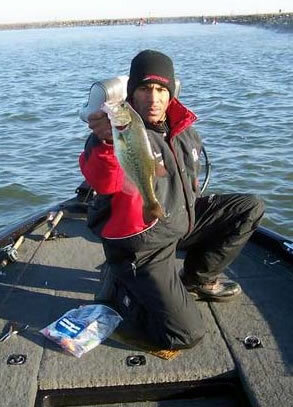 On Clinton you can use rattle traps in 50 + degree water temp and 38 degree air temp and catch 15+ bass in a day. Clinton Lake and other Power Plant coolings are a great option to work on your bass techniques in the winter months, and will keep that winter monkey off your back!!! Sometimes called the idiot rig, something so easy a child could use it, the Carolina-rig is probably the most underrated technique in today’s bass fishing arsenal. True, the rig is easy to use, but it becomes more complicated when you expand on its capabilities. Not only is it one of the most productive rigs I have used, it is also the most versatile. I will show you the different rigs and when to use them, different retrieves for both active and inactive fish, and a variety of lures that work best in several situations. PART 2 – Bass Talk, Are You Listening? Keeping what has been said in mind, all of your senses need to be wide open and receptive, because the fish will tell you where they are and what they. They talk to us in many different ways; it’s up to us to be listening. You may see them, but not catch them. You may see other triggers that tell you whether or not there are fish in a given area, but not realize it. Have you ever come into a swampy area and seen lots of frogs on the bank, but none in the shallow water or in pads at that spot. Come back in a couple of hours and they are all back in the pool. So what is a ditch and how do I find them? Ditches to put it simply are depressions in the bottom. Some people also call them a “hole”. Ditches can be natural, or created by water entering a body of water. For example, if you have a creek that pours into a lake, there will be a ditch near the mouth of the creek. These ditches are created from erosion due to current. You can find ditches in other areas as well. They can be found on flats, humps and even points.